Describe your jewelry and how it is unique from others? My work is predominantly vitreous enamel on metal - contemporary with techniques that are different from traditional cloisonne. I use opaque colors and focus on surface design, texture, and finish to create wearable art jewelry. Bold colors and an uncharacteristic matte surface finish set the work apart. What is the process of creating your craft? Do you know the outcome at the start? I start with a flat sheet of copper, which is worked into a base form and shape. From there, layers of powdered enamel are sifted onto both sides of the metal and then fired in a kiln at 1500 degrees. I then create the surface designs, adding color and manipulating the surface texture using a variety of techniques. Commonly, I draw into layers of liquid and sifted powder, exposing the base coats below. When creating individual pieces and designing new work, I often start with an idea, but find that the process takes me down a different path. I try to be open to new possibilities. How did you become a jeweler? Is this full time work? I have always been interested and involved in both art and craft. Three years ago, I began taking workshops in metalworking to fill my spare time. 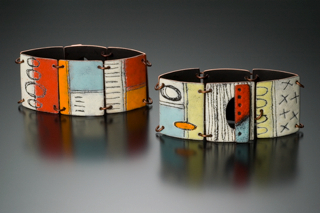 Once I started working with enamel, the work just came pouring out. It was an organic process. My pieces gained attention and praise, making it easy to transition into a full-time business. Paradise City always has a huge crowd. Due to the economic realities, are people still making purchases? People are definitely buying, but perhaps more cautiously. There is a huge benefit in having an already-established relationship with your customers. I am seeing people coming back again and again to add to their collection and purchase gifts which run the entire spectrum from accessibly priced earrings to signature pieces. What's in your future as an artist? I'll be continuing to work on my jewelry, but on a smaller scale, as I add to past collections while experimenting with new techniques and pushing the boundaries of what and how I create.